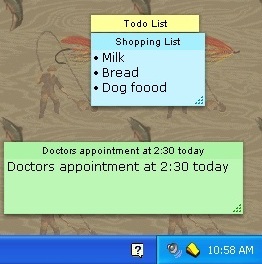 Magic Notes website - Sticky notes software for Windows. A perfect desktop sticky note solution for organising yourself, download your free trial here. Need some real help organizing your daily life? Want a really easy solution that's always there when you need it? Try our desktop notes software that does all that and more as a perfect way to replace the Sticky notes program that comes with Windows already. You can even send your sticky notes to your colleagues over the network or keep track of important events using the built-in alarm. Don't miss this opportunity to try for yourself for a free 45-day trial version. Click on the download button below and see for yourself that there are easier ways to organize your information. To find out more, click here, for more information about this sticky notes program. "I use Magicnotes everyday. It is the most helpful and least expensive little program/ piece of software I've every seen. If I want to copy something from my incoming emails or the Web I just click Magicnotes and up it pops on my screen were I can copy and paste right to the note. I make my "To Do" list and set an alarm for Magicnotes to popup and tell me it's time to do so and so. No more scribbling notes and losing the pieces of paper. I just place my notes on Magicnotes, print them out or email them to myself as a reminder. I absolutely would not be without Magicnotes. Don't tell anyone, but I would gladly pay twice what I paid for my copy of Magicnotes. I highly recommended Magicnotes. Just wanted to tell you that I forwarded info about your website and software to my daughter because I think she'll benefit from it, but also because of all your help and support. She called to say that she loves the notes and that she told all her friends. They are all using them now and having a great time with them. I made sure she'll buy once the trial is over ... I offered to pay!! This program is worth every penny I ever paid for it. Please use that statement; it is the least I can do for you and for the use of such a helpful piece of software. I use Magic Notes in spite of having all the Windows features available to me. I also thank you for keeping the program current.